"Forget the money, teach me how to code"
Microsoft, UNDP and NCW organize conference to show outcome of ICT initiative for women. 10 thousand women were trained on coding and ICT skills. Empowering Egyptian women in business usually comes in the form of facilitating loans or finance for small projects. However, now with Egypt's slight but steady progress in ICT, empowerment comes in the form of ICT skills. 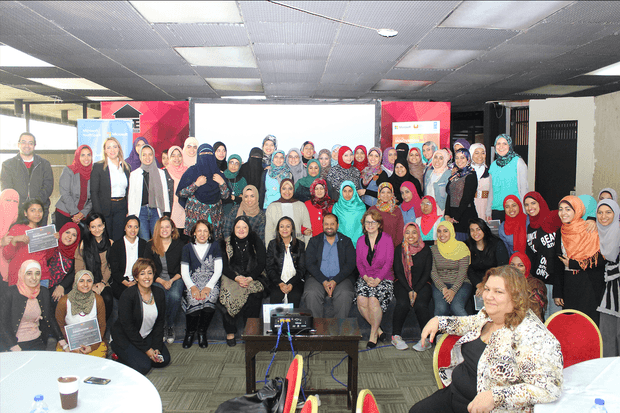 Microsoft Egypt, UNDP and the National Council for women organized "Code For Her" conference between 6-8 March 2016.The conference showcased the success stories of girls and women in the technology sector. Microsoft also launched #Makewhatsnext initiative that covers all Egyptian governorates. The initiative includes a series of workshops for women in information technology, business management and personal skills. The participants of the conference are working on turning their creative ideas into products and applications with the help of Microsoft. The initiative trained more than 10 thousand women since its launch. Earlier this month and to celebrate women's day as well, the American Chambers of commerce awarded 3 Egyptian women for their efforts in the Business sector. The women in business awards also honored Commercial international bank CIB and P&G for their efforts to support women in Business.